Britain. The height of the Roman occupation. The Doctor has brought Leela to ancient Norfolk to learn about her ancestors� but has no idea how much of an education she is going to get. Because this is the time of Boudica�s rebellion. When the tribe of the Iceni rises up and attempts to overthrow the Roman masters. 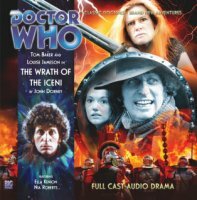 As Leela begins to be swayed by the warrior queen�s words, the Doctor has to make a decision: save his friend� or save history itself?